Cleaning your air ducts regularly is something that can help you avoid health problems in the future. Keeping the ducts clean not only helps you breathe cleaner and fresher air but it also helps you save energy and prolong the life of your HVAC system. Recent years have seen a steady increase in the number of people that are suffering from respiratory illnesses and allergies. 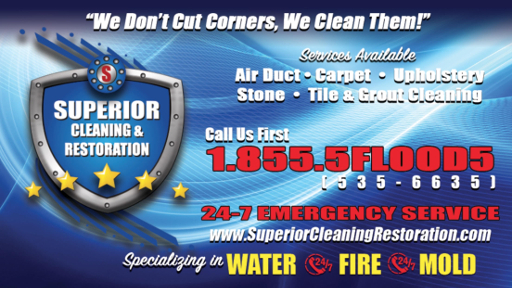 Superior Cleaning and Restoration Inc. make sure that your duct cleaning requirements are addressed in an efficient and professional way. We will remove, sanitize and agitate them with our system that uses the Roto Brush technique. We’ll vacuum your entire HVAC system with our truck mounted system. The best breeding ground for bacteria, fungi, mold, and mildew fester is the darkness and damp corners that are found in air conditioning ducts. The cooling and heating of the house depends on them, these allergens can easily spread through the house via the ducts to cause many health problems. With dirty ducts, the fresh air outside becomes much more difficult to find its way inside your home, respiratory problems may ensue. Though the cleaning of the air ducts is not the solution to the prevention of all respiratory illnesses, it goes a long way to help combat potential illness. Not only does cleaning the air ducts help you in the prevention and cure, it also helps in prolonging the life of your HVAC system. It is imperative that you clean your air ducts at least once a year, so let our team of skilled professionals at Superior Cleaning and Restoration Inc. take care of your cleaning worries so that you can live a healthy disease free life. We are the only company in Southern California with a truck mounted duct cleaning system. This is the #1 recommended system by HVAC duct manufacturers. It not only cleans better than any other system it’s also safer for the ducts and won't tear the lining which decreases air flow and efficiency.